This 12" antique-ocean desktop globe pushes the envelope of classic form. 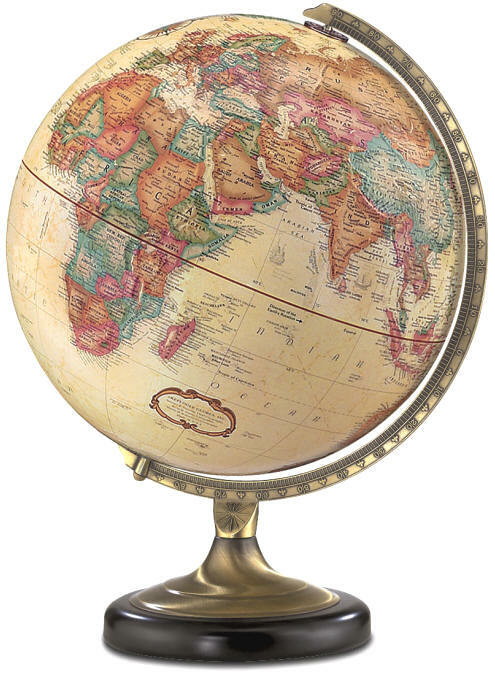 An antique brass and black metal base is the foundation upon which this globe is built. The Sierra globe features an up-to-date raised-relief political world map, longitude and latitude lines, calibrated (numbered) semi-meridian. *Raised Relief - to better emphasize the mountainous areas of the world - there are ‘bumps’ on some areas of the globe. They are called raised relief. They are there so that you can ‘SEE & FEEL’ the mountains - although their actual height on the globe does not have any relationship to the true relative heights of the mountain ranges.